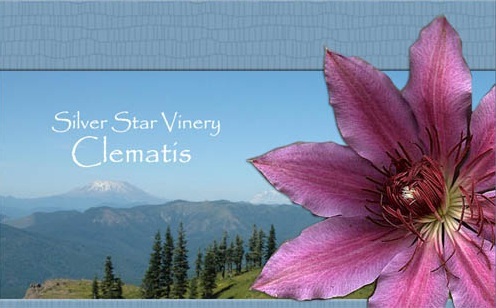 Have you ever had a dream to have a Clematis Nursery? Let me help you make that dream come true. Give me a call for more info. I love my clematis but I am loving helping others with my Essential Oil business. I would love to share with you about the difference these oils have made in my life. Coming from the South-Head North of Battle Ground on HWY 503. Go 5 miles and turn East on Rock Creek Road. Head up river towards Lucia Falls and Moulton Falls Parks. You will see our signs along the way. We are about 16 miles from Battle Ground. From Seattle head East at either Woodland or go down to the Battle Ground exit and follow directions above turning Left onto HWY 503 at Safeway. We are not open daily to the public. Visits must be planned in advance. We love to host garden clubs and groups. Lunch arrangements provided also. Walk among hundreds of clematis in our extensive Display Gardens"Blessings"
Rest peacefully under the large Walnut tree as you sense natures quietness. A Small clematis in a small pot with leaves, a single vine and a flower. You Will receive a mature 1 gallon clematis with a large root ball, removed from its gallon pot, pruned back hard, ready to be planted directly into your garden.The plant will be wrapped in recycled newspaper, then wrapped in a plastic grocery bag and put into a USPS Priority shipping box. I tape the daylights out of the box and then personally deliver my boxes to the post office which is 10 miles away to be sure they all get shipped together. I answer each and every email personally. My clematis are well rooted and currently growing in gallon pots. The soil may be disturbed during shipping but this is not a problem. If your clematis arrives with a very solid root ball please soak it in water for 10 minutes and gently tease the roots loose. You must plant your new clematis at once using care to spread the roots out as if planting a rose. There is no need to re-pot as my clematis are mature, ready to go right into your garden. Word of caution!! Do not water your clematis every day. A plant with fewer leaves needs little water so don't drown your new clematis. Adjust water needs as the plant grows. Over watering is the number one cause of death. In the early spring months my plants will be short as they are just coming out of dormancy. They are not grown in heated green houses. I do not send any paper work with the plants. You can find instructions on my Care Info page. My nursery is located in the beautiful Pacific Northwest in the State of Washington high in the hills in an area that the old timers call “Dole Valley”. My front page shows a view looking to the North from on top Silver Star Mountain which my Nursery is named after. Yacolt is the town proper to the North 5 miles. Portland, Oregon is to the South 40 miles and the famous Mt. St. Helen’s is 40 miles Northeast. The vision of my little Clematis Nursery is to offer big healthy plants, which are not easily found, at a reasonable price. As a fellow Clematis-addict I understand the need to always be on guard, ever searching for yet another Clematis I might not have. I hope I can help you fill every possible spot of the garden with Clematis-The Queen of Vines. In 1995, my mother was in her 80’s, my Dad had died 3 years before; it was time for mom to move in with me. We sold our beloved home but were able to take plants from the yard. My mother wanted me to have her old clematis“Gipsy Queen” that grew up the front porch. We dug this monster-sized plant up and planted it at my house. On Nov.24, 2000, at the age of nearly 87, my mother passed away here at home from cancer. Spring brought flowers and “Gipsy Queen” bloomed like never before. My addiction began. I see my mother’s hand at work everyday in my life. I dedicate all that I do to my mom-Rose Marie Marosi and to Jesus Christ my Savior. I have another Love I would love to share with you. Essential Oils. Yep, they have changed my life. If you would like to know about what I am doing just drop me an email or give me a call.